Technology has made many storage options available for you but many users stumble to preserve them in most effective way. This might result in loss of important data. Windows NTBackup utility can be a better choice to keep a backup of all the important data in single .bkf file. However it is equally essential to preserve integrity of technical properties of Windows XP backup file. 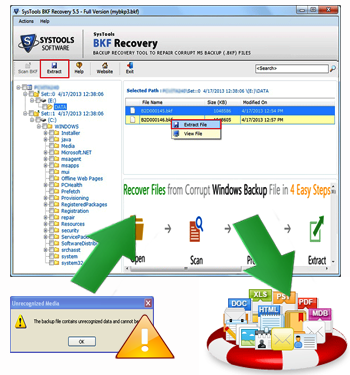 Our Backup repairing tool has been developed to restore Windows BKF file in case you fail to maintain its integrity and NTBackup restore application is not accepting your backup file. Software has been mend with advanced algorithms and thus works for even severely corrupted backup file. It allows you to restore corrupt bkf file smoothly with the help of multiple associated lineaments. To provide a complete restoration of data software initializes process with scanning of backup file. It provides three modes of scanning amongst which you can choose the optimum mode as per requirement. The following information will help you choose right mode for your .bkf file. Quick Scanning: This is a regular scanning mode which overall scans the backup file quickly and recovers data. You can choose this option for minor corruptions in your backup file. But this scanning mode is not recommended for major corruptions. Deep Scanning: In case your file is deeply damaged and severely corrupted then you can choose this option which has some very advance scanning techniques and thus allows to restore Windows BKF file complete data despite of corruption. Range Based Scanning: If you want to restore Windows XP backup file's particular portion then you can choose this option. For e.g. if you want to fetch data embedded from the first 40 % of the file then provide the range like: From: 0% To: 40% and the data situated in this portion will be extracted. The most commendable factor which is really beneficial for users is its compatibility with advance versions. Windows 7 do not support .bkf file and this makes the recovery of backup data in this machine vulnerable. However our BKF Recovery software is capable to restore XP backup to Windows 7 also thus, making the tool more desirable for the purpose. It has many other beneficial qualities like you can save the already scanned backup file avoiding wastage of time, you can save the extracted data at desired location by providing it a path, and much more. The software also comes in a downloadable demo version which is free of cost. Once you get satisfied with the functionality you can avail full benefits by purchasing full version of software.